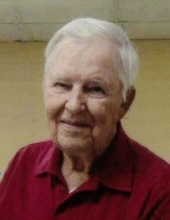 Gordon Lee Nelson, 89, of Auxvasse passed from the arms of his loving family into the arms of his Savior, freed from pain, suffering and cancer, at his home on Sunday, February 3, 2019. He was born on September 22, 1929 to Oscar Eugene and Elizabeth (Niebrugge) Nelson. He and his wife, Jo Ann, were united in marriage on December 22, 1950, recently celebrating their 68th wedding anniversary. Gordon served in the United States Army from 1948-1949 and then was in the Army Reserves. He worked for Callaway Lumber Company in Fulton for 20 years and then for Columbia Paving Company until a disabling stroke forced him to retire in 1982. Gordon was a long-time member and Elder at Concord Presbyterian Church until the church closed and he joined Auxvasse Christian Church. Gordon loved his farm, raising cows with his son, and his gardening. He has special names for many of his cows and could identify them a mile away. He shared that love of farming with his son, Gene, great-grandson, Troy, and grandson, Daniel, who will be carrying on the family tradition. He could be seen riding his Mule up and down the gravel road, checking on his neighbors and family members who lived nearby, often delivering vegetables he had grown in his garden. In spite of his disabling stroke 38 years ago, he loved to get on his tractor to mow and bale hay, and check on the cows. One of his greatest pleasures was partnering with his granddaughter Bridget to beat his sons-in-law in a game of 10 point pitch. His strength and positive attitude toward life, despite the obstacles he had to overcome, made him a role model not only for his children, grandchildren, and great-grandchildren, but for many neighbors, friends, and other family members. He will be greatly missed by those who survive him. Gordon’s memory will be cherished by his wife, Jo Ann of the home; son, Gene Nelson (Pam) of Fulton; daughters, Lea Ann Foster (Neal), Brenda Hayes (Pat), and Kathy Huddleston (Rick), all of Auxvasse; sisters, Margaret Heuer of Mexico, Hazel Chism of Fulton, and Linda Craghead of Fulton; sister-in-law, Mary Nelson of Mexico; and many nieces and nephews. Gordon loved spending time with his 10 grandchildren, Bridget Nelson of Columbia; Tiffany Fennewald (Nick) of Chattanooga, Tn., Brea Fisher (Mike) of Aiea, Hi., Mitchell Jenkins (Amanda) of Mexico, Daniel Jenkins (Kristin), Gregory Huddleston (Danielle), and Eric Huddleston, all of Auxvasse, Tonia Essel (Jason) of Portland, Or., Trenton Nelson of Fulton, and Jordyn Mackey of Vandalia; and 12 great-grandchildren who were the lights of his life: Alexys and Carsten Fennewald, Katie and Maddie Fisher, Troy Nelson, Sara and Abby Jenkins, Jadynn and Connor Huddleston, Carter and Dylan Vestal, and Belle Jenkins. He always kept a stash of one dollar bills to give each of the great-grandchildren when they came as a reward for counting the cows and picking up sticks. He was preceded in death by his parents; daughter, Debbie Nelson; and three grandchildren, Christopher, Erica, and Ryan Foster. He was one of nine children and was preceded in death by brothers, Eugene, Henry, and Ralph Nelson; and sisters, Mary Alma Kronk, and Ruth White. Funeral services will be held at 1:00 p.m. on Wednesday, February 6, 2019 at Maupin Funeral Home in Fulton with Reverend William Young and Reverend Heather Patten officiating. Friends will be received from 11:00 a.m. until the time of the service at the funeral home. Interment with military honors will be in Concord Cemetery. Memorial donations are suggested to Auxvasse Christian Church Buddy Pack Program, c/o Maupin Funeral Home, 301 Douglas Boulevard, Fulton, MO 65251. To send flowers or a remembrance gift to the family of Gordon Lee Nelson, please visit our Tribute Store. "Email Address" would like to share the life celebration of Gordon Lee Nelson. Click on the "link" to go to share a favorite memory or leave a condolence message for the family.